Phoenix, Ariz., Sept. 19, 2016 – Hartzell Propeller has delivered 230 advanced swept airfoil five-blade props for Daher TBM 700/850/900/930 aircraft, since FAA approval in 2014. The announcement was made today in advance of the Annual TBM Owners and Pilots Association Convention to be held here Sept. 21-24. The Hartzell prop available for retrofit on the 700/850 fleet is delivered as standard equipment on new Daher TBM 900/930 aircraft. Hartzell offers new props with the longest warranty for propellers offered anywhere in the general aviation industry, all the way through first overhaul. The new propeller is available through Hartzell’s Top Prop conversion program (www.hartzellprop.com) or through Daher’s dealer network. Due to the incredible strength and light weight of Hartzell’s composite structure, the propeller company optimizes blade chord thickness and sweep while achieving maximum strength. The strong structural composite construction of the carbon fiber blades and their sleek aerodynamic design boosts the TBM’s already impressive performance. 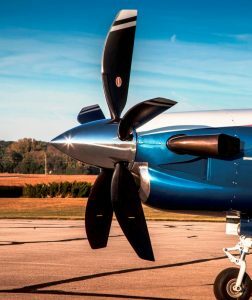 With the new Hartzell propeller, the TBM 700/850 series takeoff acceleration from zero to 90 knots is 10 percent faster than with any other available propeller. Hartzell’s ASCII propeller also provides a hundred feet-per-minute faster climb. Cruise is two or more knots faster than the Hartzell four-blade metal prop and a full five knots faster than a five-blade wood-core propeller. The Hartzell five-blade prop is also significantly quieter in the cabin and in the pattern.